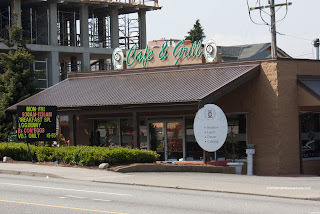 For the longest time, I've driven by James Street Grill on Canada Way and assumed it was your typical North American restaurant. Judging by the exterior and the name, that is not a stretch. However, how very wrong I was. Making it out there for lunch, I discovered that the menu was predominantly ethnic with things ranging from Mediterranean to Indian. Sure, there are the typical North American fare as well; but it is definitely not the focus of the place. I mean, even the decor did not prepare me for the menu. Hey, personally I am very fond of ethnic food, so it was a pleasant surprise of sorts. Luck would have it, everyone seemed to be in the mood for breakfast. 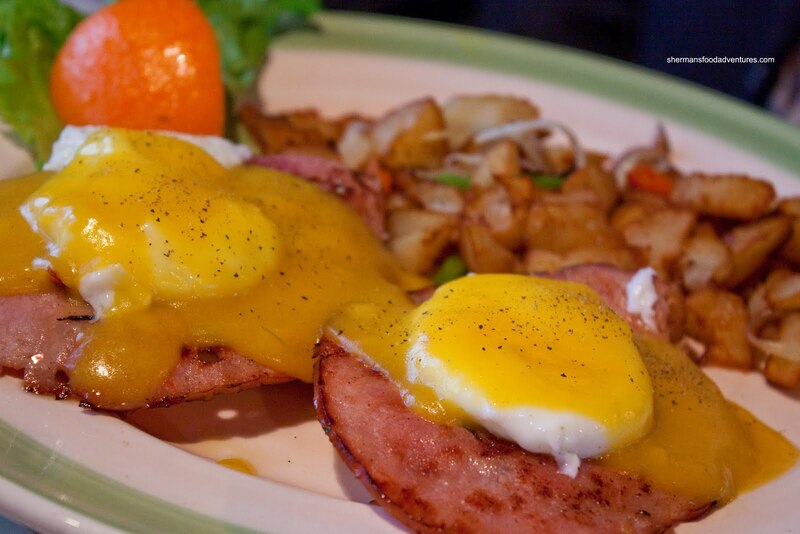 And Eggs Benedict no-less! What's with the monotony? I couldn't even convince Viv into ordering something else! Well, I'm sure that she realized it was a good idea to listen to me after she tried the Eggs Benny. The poached eggs themselves weren't bad; but they seemed to be missing a whole lot of the egg whites. At least the yolk was runny. Viv was not impressed with the Hollandaise sauce though, it was of a strange colour and didn't have enough lemon. The "ham" wasn't really all that good either. A sub-par effort. 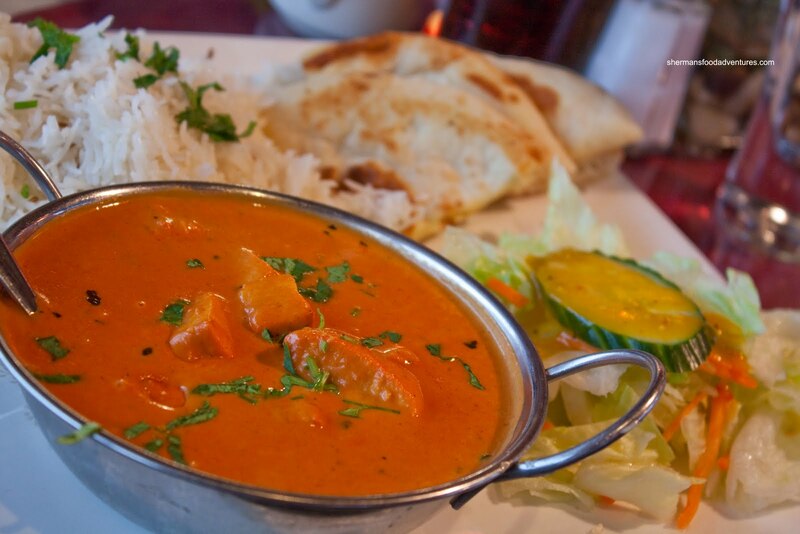 For myself, I decided to go for what appeared to be their specialty, which was Indian food. I got the classic Butter Chicken and hey, it was not bad. I found that there were a nice balance between creamy and tomato. Furthermore, it had spice, quite a lot actually. And that's the way I like it. The picture doesn't do it justice, the portion size was very large. Lots of chicken and lots of sauce. I wasn't a huge fan of the naan though. I found it too soft and in need a bit more charring. 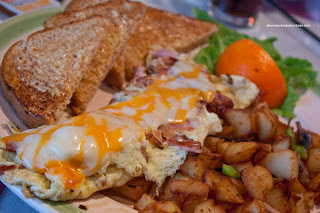 Another breakfast item at the table was the Cheese Omelet. Okay, I didn't actually get to try it; yet it wasn't really necessary nor did I want to. Look at it for a moment. The egg was hardly scrambled. Rather, it looked as if they had the heat on too high and they ended up making a fried egg which they folded into an "omelet". 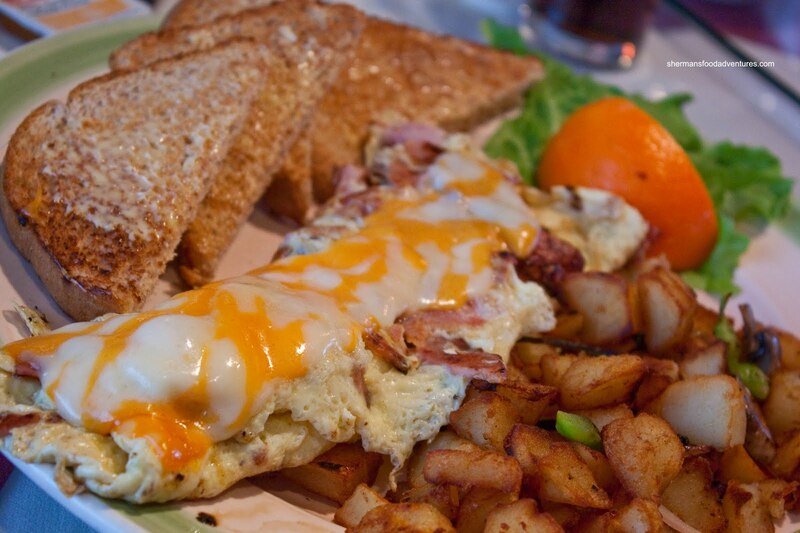 Slap on marble cheese and put it under the salamander and voila - a cheese omelet. Uh... no. It was confirmed that it was a poor attempt at an omelet. Textures were wrong and so were the visuals. The last unique item on the table (darn those 3 Benedicts!) 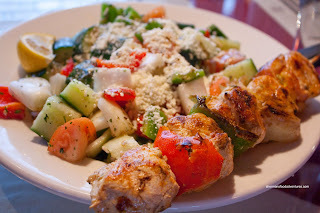 was the Chicken Souvlaki with Greek Salad. As you can see in the picture, the salad was vibrant and seasoned with the proper ingredients. The word was that the chicken was slightly dry though. As you can clearly ascertain from the items on the table, the food here is a bit hit and miss. Go for the breakfast items and it may disappoint. Stick with the ethnic items and it may turn out to surprise. 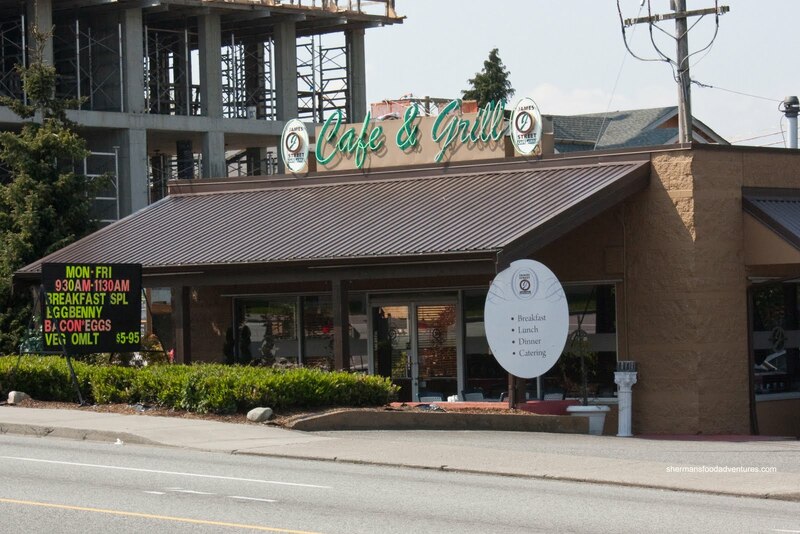 Do you know if this place has any relationship to the restaurant of the same name at the corner of Boundary and 29th? I drive by that all the time and never stop, just curious whether they're related. @Kat Yah, same here. Now I know... Not sure if I'd necessarily return though.